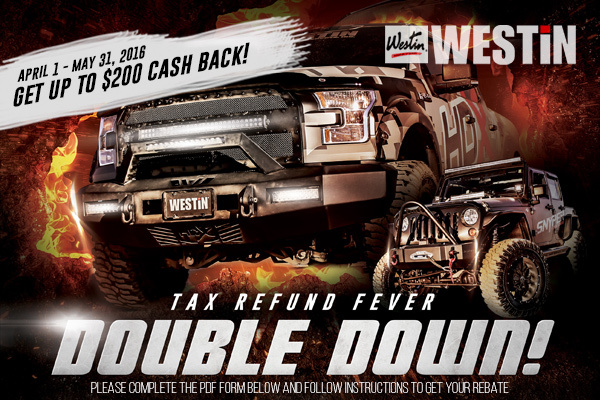 Double Down Tax Refund Fever from Westin! - Ford F150 Forums - Ford F-Series Truck Community. You are just one step away from upgrading the magnificent look of your truck! Purchase any two (2) qualifying Textured Black HDX or Snyper Bumpers and GET a $200 cash back or receive a $75 cash back with the purchase of any one (1) qualifying Textured Black HDX or Snyper Bumper. Hurry up! This offer is valid from April 1 through May 31, 2016. Please complete the PDF form and follow instructions to get your cash back. Quick Reply: Double Down Tax Refund Fever from Westin!